Sub: Enhancement of period for purchasing unreserved reverse tickets during Mahakumbh Mela. Maha Kumbh Mela is going to be held at Allahabad in 2019. A large number of passengers are expected to be dealt by Mela stations of Northern, North Central and North Eastern Railways during the event. 2. In view of the enormous rush of people visiting Allahabad during the period of Mahakumbh Mela, in addition to provision of additional unreserved booking counters, it is necessary to offload the booking counters and facilitate passengers in booking of tickets in advance. i. If a passenger purchases an unreserved return ticket through UTS from any station on Indian Railways for journey to any one of the 12 stations in Allahabad region serving the Mahakumbh Mela viz. Allahabad Junction, Allahabad City, Naini, Subderganj, Rambag, Prayag, Prayag Ghat, Daraganj, Phaphumau, Jhusi, Vindhyachal, Chheoki and back, the return ticket shall be allowed to be booked up to 15 days in advance excluding the date of journey, e.g., if a passenger at Nagpur wishes to purchase ticket to any station in Allahabad Mela area and back, he can purchase the same 15 days in advance. No refund shall, however, be allowed on such return tickets. ii. The date of journey shall be indicated on the ticket. iii. This facility shall be available for tickets purchased on or after 11th January 2019 up to 6th March 2019.
iv. Above facility shall, however, be subject to the conditions stipulated in CC no. 5 of 2016 regarding non-issuing of return journey tickets for a distance up to 199 km. 3.1 Zonal Railways should also define the probable routes in UTS from where traffic is expected to move towards stations in Mahakumbh Mela area. 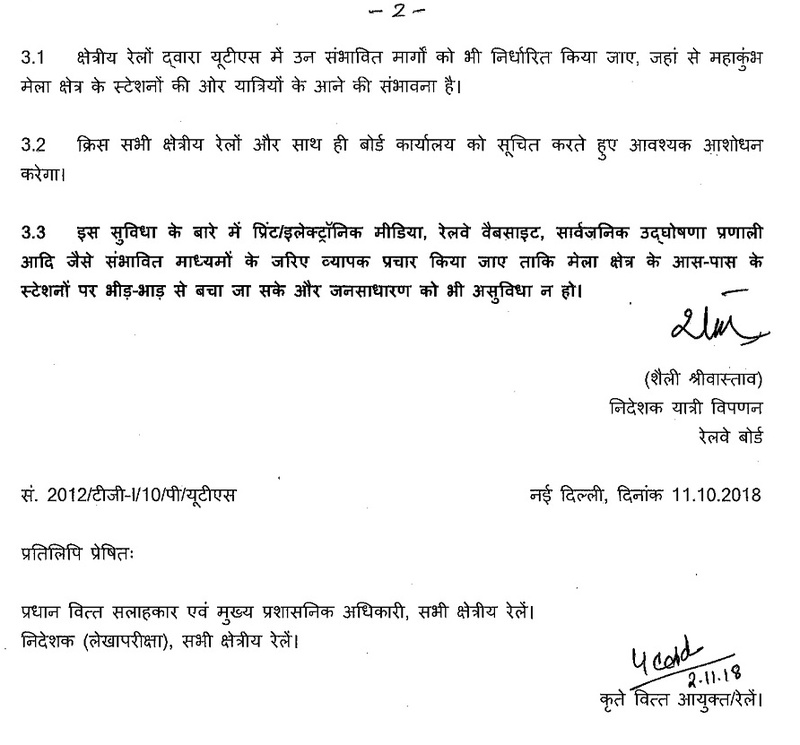 3.2 CRIS shall make necessary modifications, under intimation to all Zonal Railways as well as Board’s office. 3.3 Wide publicity through all possible means viz. Print/Electronie Media, Railway Website, Public Announcement System, etc. should be given for dissemination of information about this facility to avoid congestion at the stations serving Mela area and also to avoid inconvenience to the general public.